If you're on a budget and/or not ready for that overly extensive DIY build or upgrade, here's an idea from one of our readers. *Ed Note: Also see new item below we're adding to our regular Friday Strat feature. Michael sent me the scoop on this great eBay deal he got. All he's done so far is replace the pickguard with the tortoise shell one you see here making it both striking and unique when combined with that sonic blue finish. Keepin' it simple with some nice touches! "...This strat was an ebay purchase. It came stock with some sweet sounding custom shop 69 pickups. It is the MIM Classic Player 60's model (custom shop 'designed') with the 12" radius fretboard on a maple c shaped neck. The neck has no skunk stripe and the 60's style truss rod adjustment at the heel. The trem is the vintage two point variety. It works better than any Strat trem I've used before. The only thing custom about it is the pickguard I added. 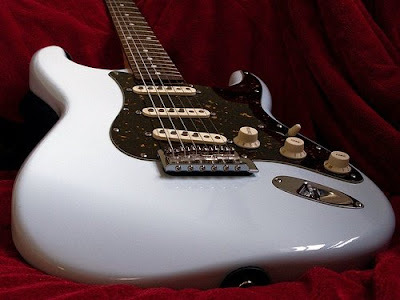 All in all, a really great Strat that competes with American Standards at a budget price..."
*New Feature Item: Strat, Food & Beverage Combinations! Food: Rasberry Ripple ice cream topped with chocolate syrup & crushed fried pork rinds. 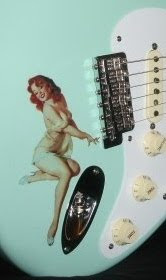 Find MIM Strat deals at eBay!